So my first mustard turned out quite well. Pretty pungent, but still very good. After learning that the brown mustard seeds were the spicier ones, I decided to shift 1/2 Tbsp of the total 6 Tbps of seeds from brown to yellow. 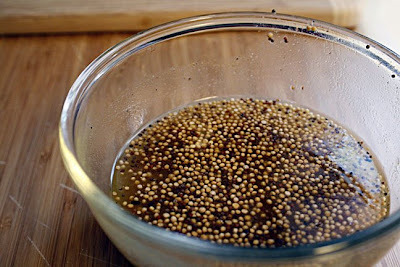 Since my intention at first was to be making beer mustard, this will be the first try using beer in the recipe. For this one, I'm using a pretty low-key beer: Red Hook Blonde Ale. It's one I've had sitting in the fridge, but wasn't terribly excited about drinking. I'm doing a direct swap with the 1/3 cup of wine from the first recipe, so that the solid to liquid ratio remains the same. 2. 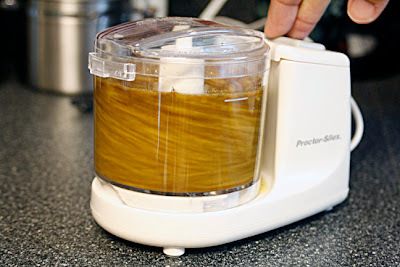 Blend everything together in a blender or a small food processor until you achieve the desired consistency (pasty). • Still quite pungent, but noticeably sweeter -- probably due to the beer and the addition of some sugar. Might drop the sugar next time around. I've also read that heat can reduce the pungency of mustard, so I might heat the mixture slightly next time to take off a bit of the edge. • The seeds didn't grind down quite as much as they did last time. I'm wondering if the lower alcohol content of the beer (approx. 5% abv) compared to the wine (approx. 12% abv) played a role in this. Might try a stronger, more flavorful beer next time. • Overall, I enjoyed this more than my first attempt. I served this with bratwurst at an Oktoberfest party we held last week, and it went quickly. A lot of positive comments on it, especially from those who enjoy a strong mustard. Be sure to stayed tuned for more adventures in my ongoing quest to achieve Bobby's Ultimate Beer Mustard!